Is your skirt looking sad and flat? Do you find yourself twirling around the room just to get some darn volume in your skirt? We get it, volume is important, how festive can any dress be without that ever important flounce factor? Just stop spinning for a second and hear us out, aren't you getting dizzy? Try wearing this fun pink petticoat under your skirts and dresses for perky volume even while you're standing still. The 50's were a time of Jell-O molds, diners, and Coca-Cola. It was the era of bubblegum pop and keeping a positive attitude. A jaunty pop in your skirt was a sign of fashionable pep in your step. 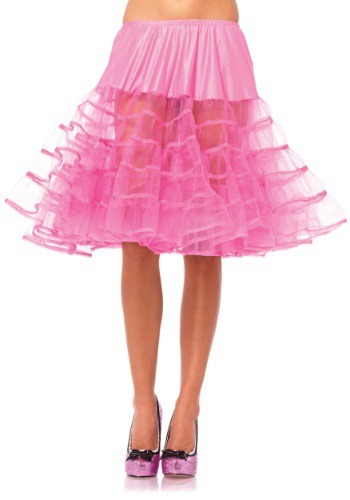 When you're putting together your 1950's inspired costume, whether you're going for Suzy Homemaker or Sandra Dee, this bright pink petticoat will lift your spirits and your hemline. You can still twirl around the room but now vibrant pink tulle will peep out from under your hem, now isn't that festive?